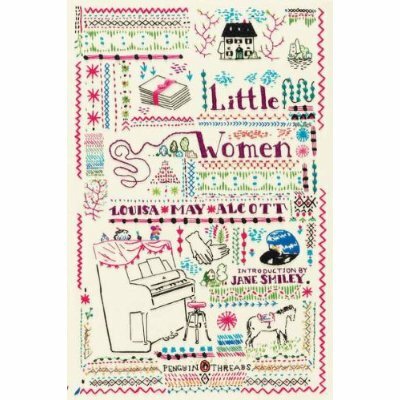 I first read Little Women as most girls do sometime between the ages of 10 and 13 and, like many others, I’ve always remembered it fondly. I’ve seen the movie versions and even a community theater production many years ago. So when I unwrapped my new Kindle at Christmas, it was one of the first free downloads I made. Rereading this classic has been extremely interesting and worthwhile, I think. There are some scenes I literally recall word for word, but some elements that I have no memory of at all. I also find myself thinking of the characters and their struggles great and small much differently so many years on. I’ve read what a few others have thought when reexperiencing the book as an adult, and two feelings in particular seem to be common. 1. The book is far more moralistic than I remember. 2. While I actively disliked Amy as a child, I quite like her now. In terms of the first point, the book is quite strongly vocal about Protestant morals of the time and goes beyond just “teaching lessons” with each event. Jo advises Teddy never to drink and he shakes hands on it, a promise that Alcott tells us he will never regret. Jo takes to writing “sensation” stories to make money, which seem to just be what we would call fiction today, but these tales begin to weaken her morally and something terrible might have happened had not Professor Baehr admonished her against them. Some of the lessons of the time do not mesh with how we’d want a girl to behave today. Amy prepares an art table for the fair and a rival demands that Amy let her run the table. Instead of defending her work and being proud of it, Amy gives up her table and the lesson is that she should turn the other cheek. But speaking of Amy, I found her to be a much different girl than I remembered. The fault may lie with the film versions, which make her out to be very vain and spoiled. But though the Amy of the book begins a bit silly, it must be remembered that she is the youngest and will of course say and do the most childish things. As she grows up, Amy is not vain or spoiled at all; rather, she is quite grateful to others, and seeks to make them happy. While I remembered Amy’s trip to Europe as a slight to Jo, the actual event is quite different. In reality, Jo is rude and snobbish to her aunt, while Amy is appreciative, kind and patient, so her aunt chooses her for the trip. I also remember feeling quite let down that Jo didn’t marry Laurie, but in my rereading I now agree with her feeling that they are too alike. I think this is a lesson of age. At 12 or 13, I would have been just like Laurie and nothing would have pleased me more than to fall in love and marry a childhood sweetheart. It would have been poetic and romantic. But now, I see things Jo’s way and understand her choice. Meg’s character also surprised me as some of the qualities I had given to Amy are actually hers. I remembered Meg as almost motherly, as a demure girl who marries the sweet tutor next door. But Meg is the one who longs for riches, who lets herself be dressed up in finery and paraded like a doll at a friend’s ball until she is shamed by comments behind her back. Meg is also described as the beauty of the family, where I had always imagined her as plain and Amy as the beauty, perhaps because of the old blonde v. brunette trope. I send my apologies to Amy; you are exonerated and Meg, rather than being ruined by these realizations, is actually given dimension and humanity. P.S. I just discovered this book cover and now I want to buy this edition. So cute! I find it fascinating to reread books that I read when I was younger. The parts which stand out to me change so much over time. Also, I was an impatient reader and I tended to skip over things so that I found passages in what must have been my fifth time reading The Secret Garden that I would swear I had never read before! I really appreciate SOMEONE finally giving Amy the credit she’s due! A much more likable and developed character than Jo imo, who is rather self absorbed and never called out for her own brattiness by fans as Amy is (plus keep in mind Jo deliberately almost let Amy dies, and I’ve seen people cheer this!). Of course, I love all the girls, but I just find myself liking Jo less as I mature for some reason. Though I strongly disagree on Meg. Not that she isn’t vainer than the books say Amy is (only a bit though), but that she lacks dimension and is nothing but vain. She is motherly as you said, but I think people forget Meg is a teen just as her sisters are. Her whole struggle is wanting to grow up and face reality vs her still childlike, idealistic demeanor (similar to Jo’s but different- Jo doesn’t want to grow up and Meg does). She can be a kind, generous person but quite rightly calls Laurie out on his rudeness. Humble, but has some pride. As someone who also grew up poor, I can relate to her never wanting to deal with that again as a young adult. Just because she becomes a homemaker doesn’t make her a flat, boring character. Alcott makes it very clear Meg has chosen a fate every bit as fulfilling as Jo’s or Amy’s. I would say it is entirely Beth who lacks dimension. Don’t kill me- I love her! I relate to her anxiety and love for cozy activities at home and cats. But she’s a Purity Sue: she lacks negative flaws. She’s too perfect to corrupt, unlike the others. Everyone likes her. You almost aren’t surprised that she is Too Good For This Sinful Earth. Marmie is almost as pure too. I sincerely don’t mean any of this as criticism- I enjoyed your review and LOVE LW discussion that doesn’t hate on Amy!